It should be noted that other than the slight edit of the wording in its Sudden Flash attack, it is a direct reprint of the Dunsparce card released in EX Sandstorm. There is also a subtle change to “Strike and Run”. The original did not have ” If you put any Pokémon onto your Bench in this way…” or equivalent wording. 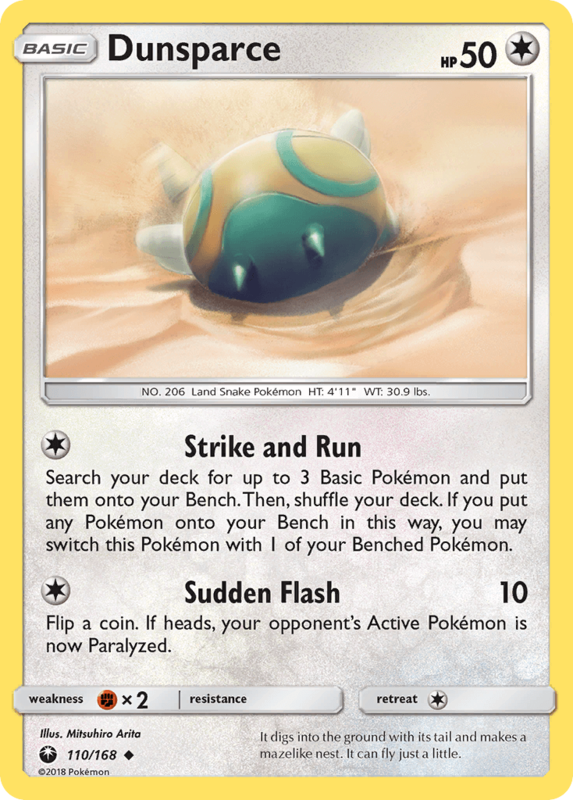 The change to “Sudden Flash” actually would NOT prevent this Dunsparce from being treated as a true reprint, as the game no longer has 2-on-2 Rules, but Strike And Run only allowing you to Bench the attacking Dunsparce if you searched and Benched at least one Pokémon is a significant difference. I mean, I’d REALLY prefer card were just designed so that, after another two years, there just wouldn’t be any decks capable of attacking for damage T1.